Just wanted to let you know this week, the 13th-19th April 2015 is Chiropractic Awareness Week and the theme is around the importance of sitting correctly and getting up regularly! 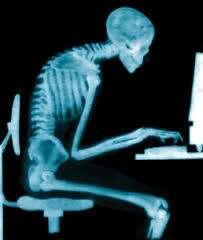 Research conducted by the British Chiropractic Association (BCA) reveals that sitting is one of the top triggers for people with neck and back pain and as a general population we are spending more and more time being sedentary. Two thirds of us spend most of our working day sat down, while increasingly children and adults are spending more time on mobile phones, tablets, laptops and watching TV. This is increasing strain on our spines and can potentially lead to more back pain. The answer is to sit correctly and get up more! Don’t get into bad habits of slouching when sat down. Try to minimise sitting wherever possible and move more regularly! Consider using a sit/stand desk instead of a traditional desk. There are lots of things you can do to improve your posture and impact the health of your spine. For further help or advice email: info@heathcotechiropractic.co.uk. To encourage more people to consider Chiropractic Care, we are offering a limited number of half price consultations this week (13th-17th) for any potential new patients and £10 off their next visit for the patient that refers them in (normally £5 off). So if you know anyone who is considering coming to the clinic, now is the perfect opportunity to get this discount. It will only be available for the rest of this week, however, as a Chiropractic Awareness Week special!